Home / What’s the best way to compare products on QuiBids? Every product auctioned or sold on QuiBids has a product page, each of which includes a ton of information to help you compare with other products and otherwise make better-informed decisions about how you spend your bids. 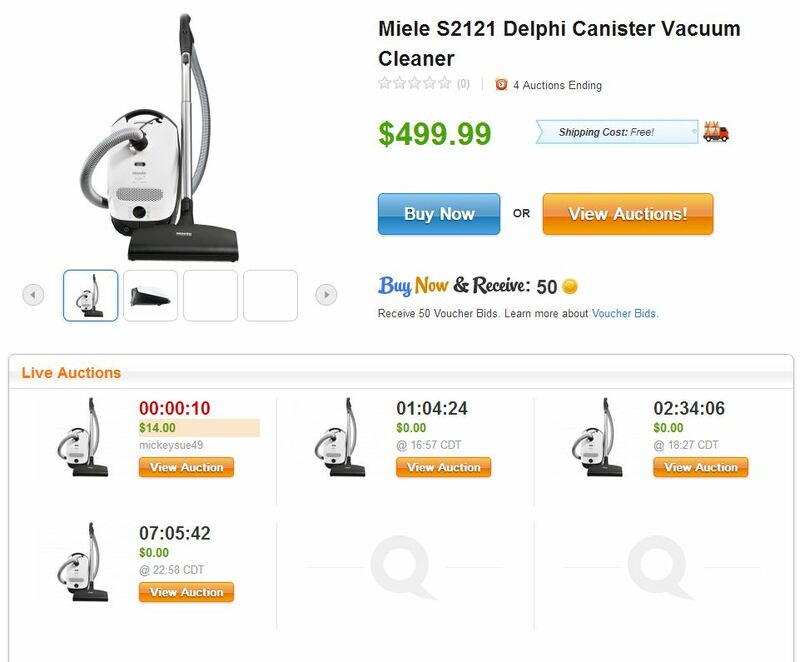 Since we sell a lot of vacuums on QuiBids, let’s use this product page for a Miele Delphi Canister Vacuum Cleaner as an example. From the product page you can quickly compare auctions to see if there are any more for the product coming up, but you can also scroll down a little further to the product description, which is where we keep the good stuff. All the information you could possibly need to know about your vacuum’s listed down there, including its features, cost of shipping (which is now free on pretty much everything on QuiBids sold in the US), and its return policy, should you need that. Also be sure to check out the auction statistics so you can gauge how many bids a particular product seems to be costing bidders and compare it with similar products. For instance the Miele Delphi Canister Vacuum Cleaner has recently cost up to 500 or so bids to win, while this cheaper Dyson vaccum’s been going consistently for much less. Also at the bottom of every product page is a tab for what we call QuiBids Reviews. That’s your section to sound off on the products so that others can gauge what to expect from each product. Let’s look at the Canon EOS Rebel T4i for an example. You can quickly gauge the product’s quality by its star ratings, and as you can see at the right of the tab above there are excerpts from the Most Recent Review, Most Helpful Reviews, and Most Helpful Critical Reviews. The latter category might be best if you’re looking for the real, nitty-gritty truth about your desired product! Scroll down a little further and there are often pages and pages of reviews, which you can comment on and mark as helpful or not helpful. Here’s a guide to writing quality product reviews from a contest we ran a while back!